The fourth book of the Asperger series. Samuel is able to answer questions but has difficulty expressing his experiences as other people. In this book, his Mother asked the Question “Where is your Father?” Samuel has no recognition of his Father and no feeling about his Father. He sets about answering the Question and it takes him to Los Angeles. Things become dicey and questionable for the group. There are some really funny things that happen because of Samuel interpretation of the events. Will Samuel be able to find his Father’s address? I highly recommend this book and series. Disclosure: I received a free copy of the book from Midnight Ink through NetGalley for an honest review. I would like to thank for this opportunity to read and review the book. The opinions expressed are my own. 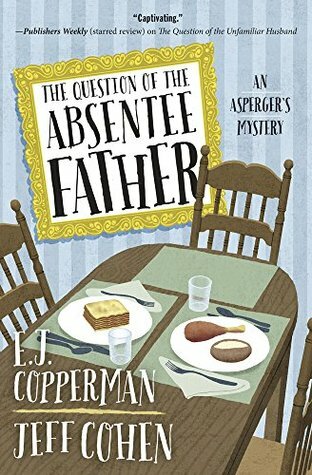 This entry was posted in Books, Uncategorized and tagged Asperger, cozy mystery, E. J. Cooperman/Jeff Cohen, false money, Father, Favorite, Los Angles, Samuel. Bookmark the permalink. Interesting. It takes a sensitive writer to be able to describe the humorous side of Asperger’s without making fun of the person with the disorder. Yes, I have enjoyed all of these books that I have read. I read the first couple of books in this series and I really liked them. I laugh at the antics in Lo s Angles. They were funny especially when he ended up on the freeway. I have to start back on that series.